At the beginning of this year, my friend Peng invited me for a DIY trip to Apo Reef and Pandan Island in Sablayan, Occidental Mindoro. 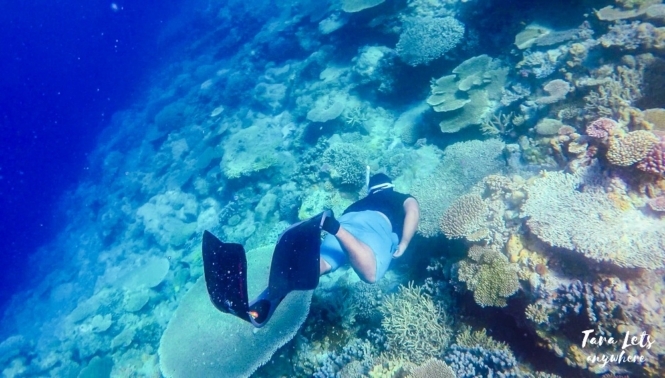 I’ve always wanted to go to Apo Reef but never had the chance to before, and I believe it was just the perfect timing because I’m a bit more confident in the water and can snorkel freely. Here’s my experience on our 3 days trip to Apo Reef Natural Park and Pandan Island, including a travel guide section. Before anything else, let me give you a short bit of introduction. Apo Reef Natural Park is a nature’s gift in the Philippines. It’s the largest atoll-type reef in the country and the second largest in the world, next to Australia’s Great Reef Barrier. 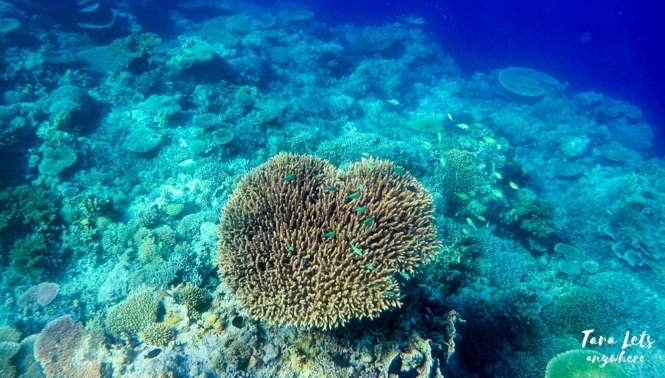 It has crystal-clear waters and home to 285 species of fish and 197 species of coral. Basically, it’s a paradise for snorkelers, freedivers and scuba divers. 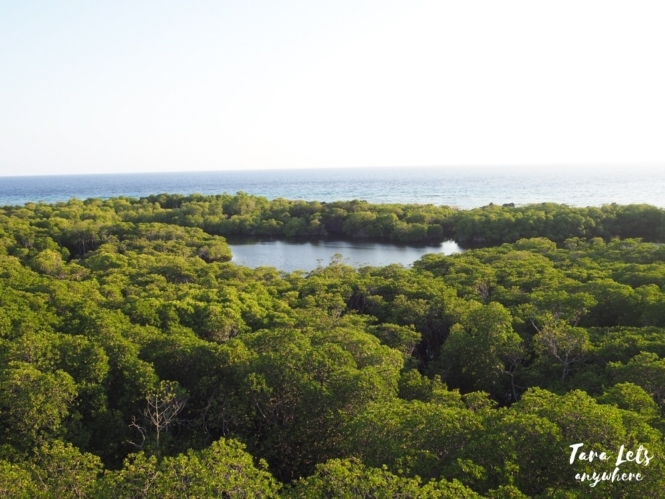 Apo Reef Natural Park consists of 3 islands, namely, Apo Island, Apo Menor and Cayos del Bajo. 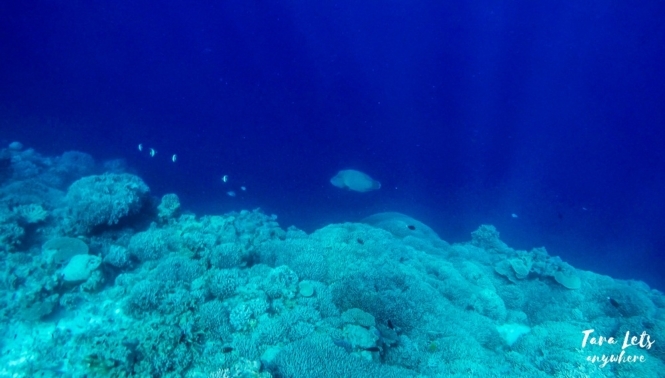 Apo Island is the largest of these three and also serves as the campsite for tourists in the island. We arrived at Apo Island and the first thing I noticed is the beach. As a beach lover, I have high standards when it comes to tropical beaches — and the shores of Apo Island deserve a high rank in my list. The water is clear and blue, the sand is fine and pinkish when wet. Whenever I hear about Apo Island it’s always for its underwater beauty, so discovering this beautiful beach was a pleasant surprise for me. Pinkish-sand beach in Apo Island. 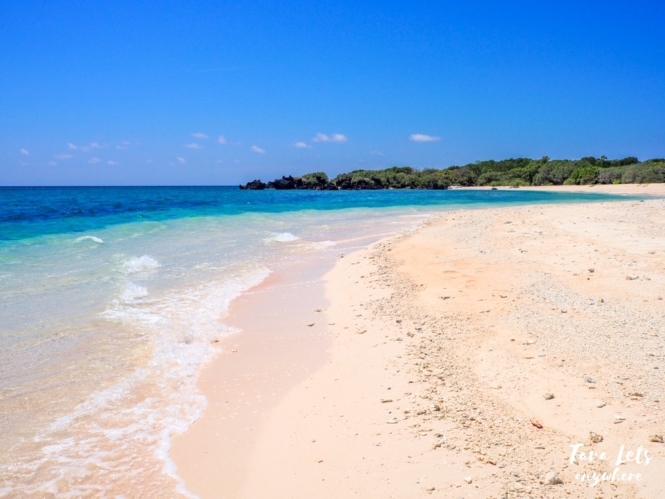 This shore serves as breeding ground for pawikans (sea turtles) and is off-limits to tourists. 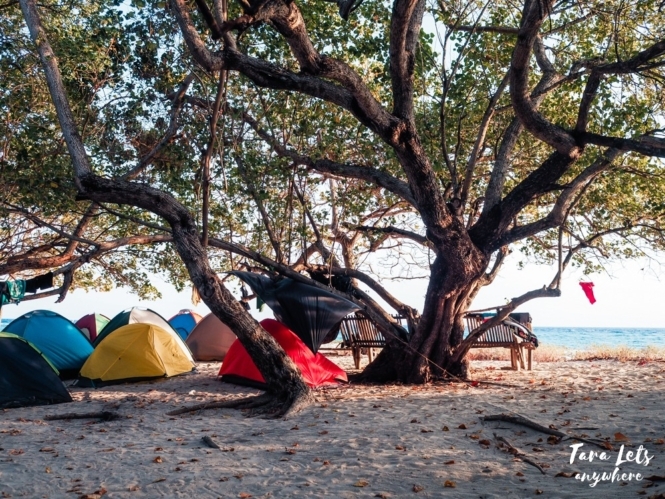 We found shades under the trees in Apo Island and camped our tents. Afterwards, we took a dip in the beach. My past trips had always been to farms or pool resorts, I’d forgotten the way my body floats in the ocean. It was calming and refreshing, like I’d forgotten and then rediscovered a thing that gives me joy. From here onward, our time was dedicated to swimming, snorkeling and, for a lot of people who joined the trip, freediving. We’d board our rented boat and our tour guide will stop at specific parts around the island. 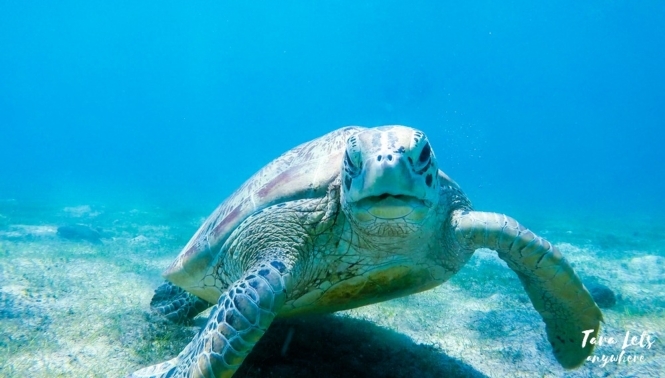 There’s an area where there are sightings of white-tip sharks, sea turtles and other fishes. This part is deep and best fitting for freedivers, especially if you want to see the animals up close. I did see sharks and sea turtles, but since I was only snorkeling from above these only last up to a few seconds before the animals ran away. 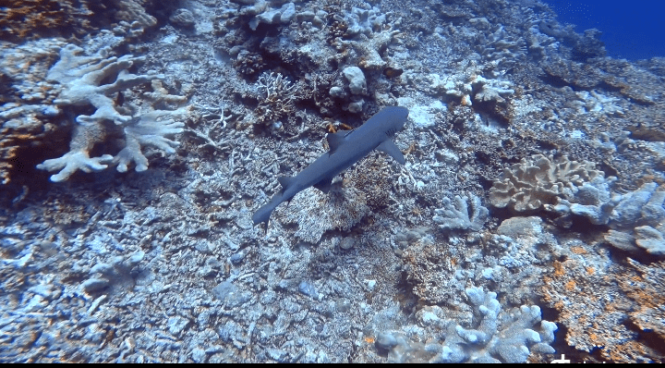 The small sharks in particular could only be observed from several meters, since they swim away from humans if you get to close. 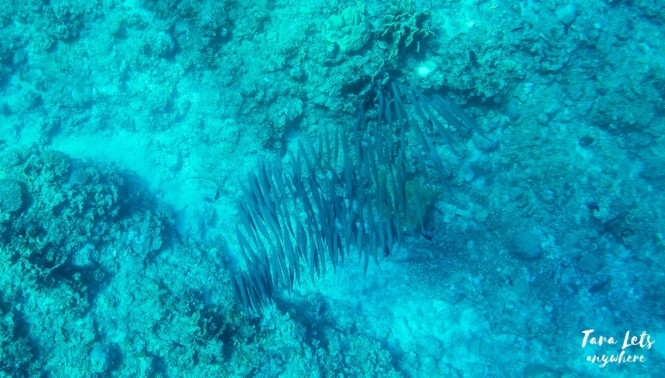 I also saw a school of barracudas. At one point, our tour guide pointed to a lobster with white antenna, although by the time I swam to its home, it had already retreated under a rock. It’s the same with an octopus we saw. Mameng along the coral wall. Spotting different types of creatures requires not only the ability to swim confidently, but also a keen eye and perfect timing. Another interesting stop is this area where we could see underwater canals. I’m not sure what the purpose of these canals are, but the freedivers in our group were more than happy to practice swimming across them. 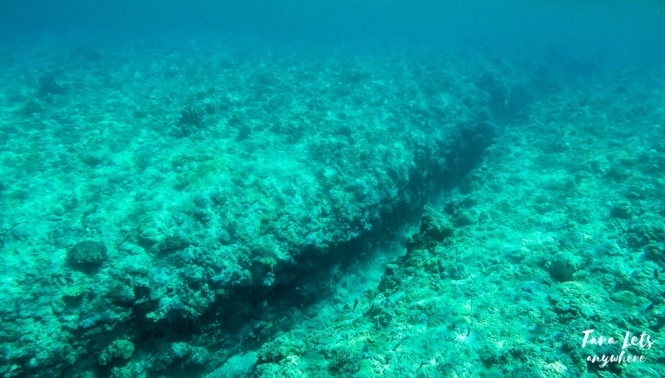 One of the underwater canals in Apo Reef. Among the snorkeling areas around the island, a favorite of mine is the coral wall in front of the lighthouse. 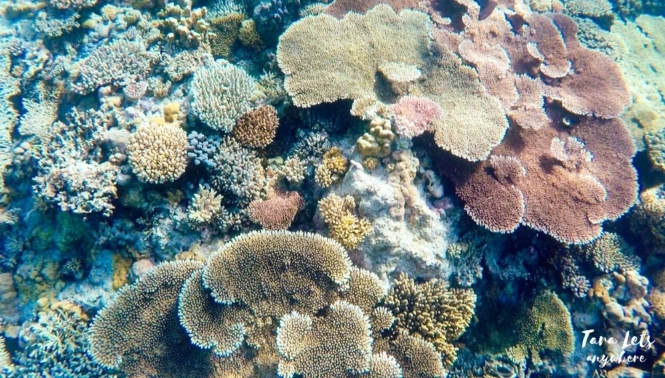 It reminded me of the long coral wall I’ve snorkeled at in Tomia Island in Southeast Sulawesi. There were table corals and other types of corals, fishes such as parrotfish, mameng (humphead wrasse) and other fishes I can’t name. 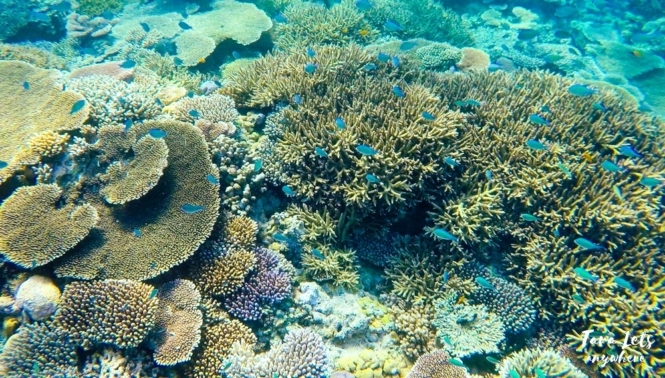 The whole coral garden was very much alive, thriving and colorful, and stands as a huge contrast to the deep-blue side of the ocean which marks where the coral wall ends. Snorkeling area in front of the lighthouse. Here’s my friend Peng freediving in the coral garden. When we were not in the water, we were either replenishing ourselves with Ate Perla’s cooking, taking a nap in hammocks or beside the beach or otherwise exploring the island. 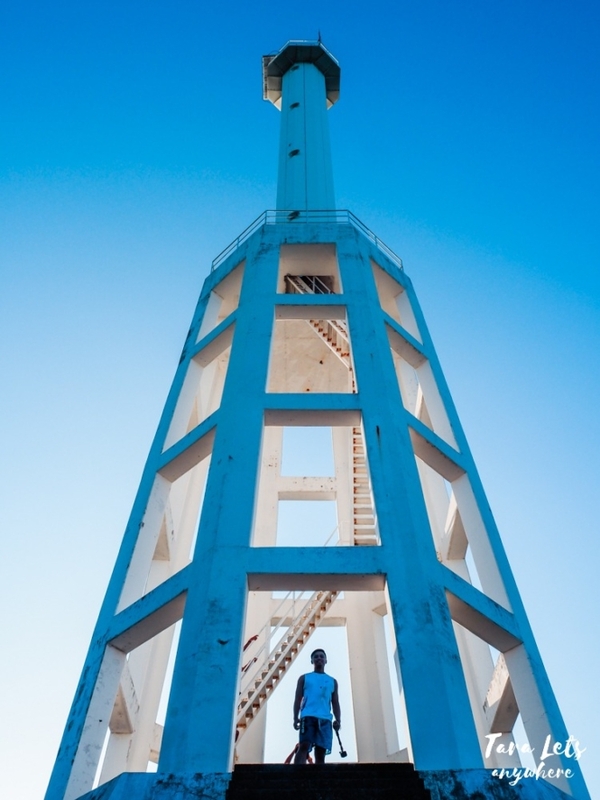 We visited the Apo Island lighthouse, a 110-foot white tower that offers an overlooking view of the island. We climbed up the lighthouse and the views were breathtaking. I imagined it’s what the views are like using a drone. We could see the surrounding water (in different shades of blue, with the coral areas peeking through), shores, karst rock area that suggests this island must have been underwater a long time ago and finally the lagoon aka mangrove forest. Speaking of which, we also went to see the lagoon. It was actually a fun detour and the trail to the lagoon felt looked like a scary forest in a fairy tale, with tree brambles on the boat, a boardwalk with queasy steps to the lagoon and the mangroves which creates a quiet, dense ambience. The lagoon is interesting in itself because it serves as a breeding ground for stingrays and sharks. Obviously, the lagoon is connected to the ocean via an underground hole although researches have yet to find where it is. Beach view from the lighthouse. Lagoon view from the lighthouse. At past midnight, some of us would wait for the Milky Way to appear in the sky. 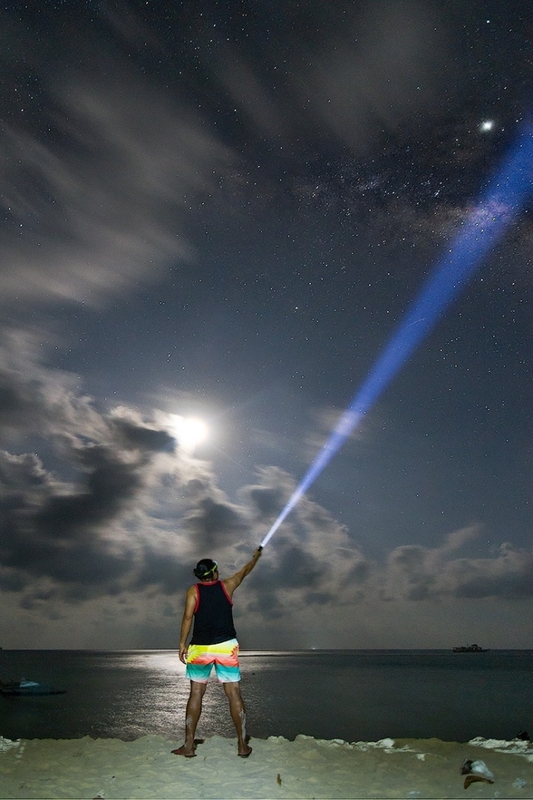 Apo Island is a great astrophotography spot because it’s far from major cities and provides a clear view of the Milky Way, provided there aren’t any clouds at night. 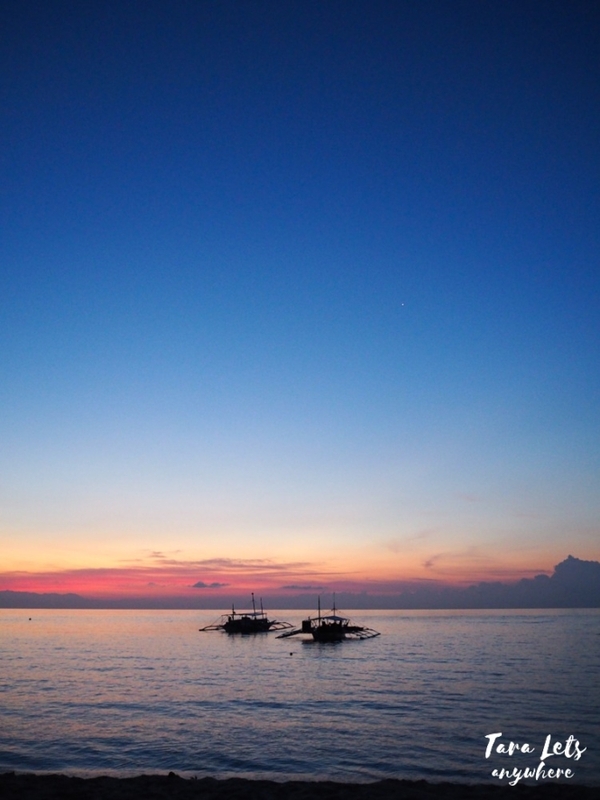 Overall, our stay in Apo Island was a blissful camp-style exploration. 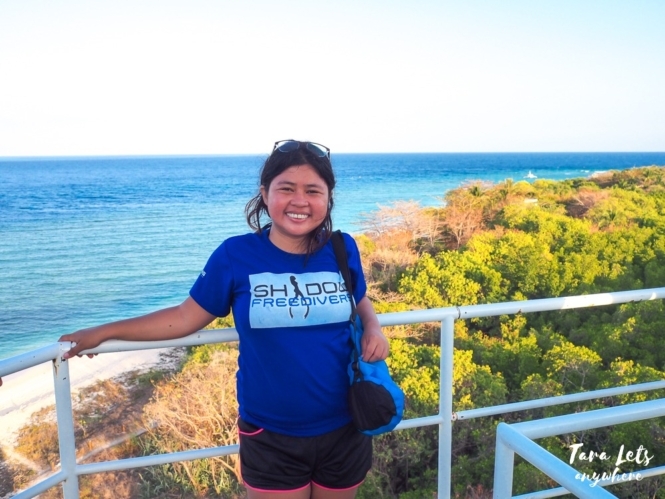 I wasn’t very comfortable with the basic restroom and lack of fresh water as well as the humid temperature at night (it was very hard to sleep), but it was compensated with the nature attractions we saw and experienced. This is possibly one of the best eco-destinations in the Philippines. This is a spot where an unknown freighter has sunk a long time ago. 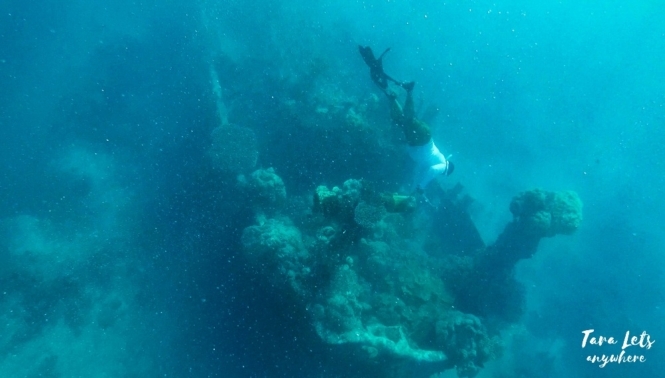 The freighter is now covered with corals and lies at 12 meter below at the maximum, which makes it an easy dive and a favorite among freedivers. Personally, I appreciated the shipwreck but would have allotted less than an hour here. The majority of our group were freedivers so they were more excited at the shipwreck than I was. There was a lot of posing and picture taking and this was definitely a highlight for them. 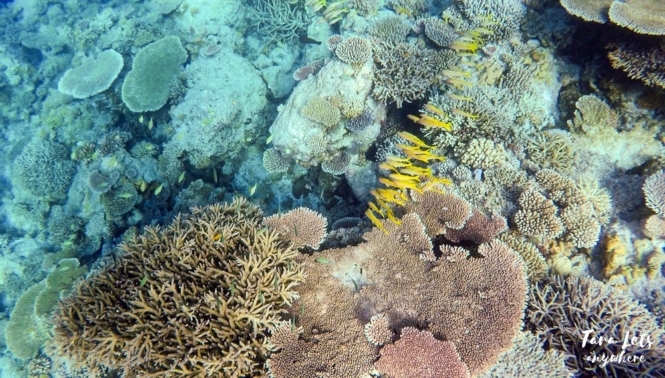 Pandan Island is not part of the Apo Reef Natural Park. Instead, it’s a private island where you can find a small resort. 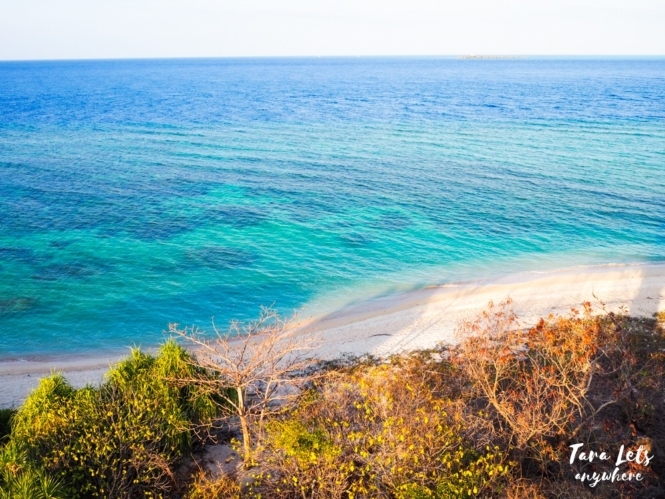 A visit in part of Sablayan wouldn’t be complete without a stopover at Pandan Island. 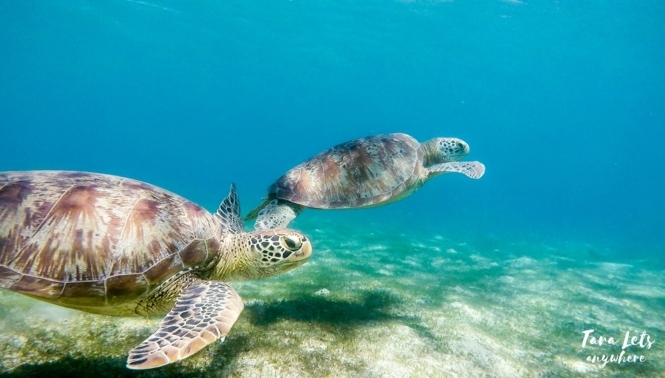 Pandan Island is famous for sea turtle sightseeing. The turtles don’t just visit here from time to time, according to our tour guide THIS is their home. Compared to Apo Island in Negros Oriental (also famous for sea turtle sightseeing activity), in my experience it’s easier here to spot sea turtles. You only have to swim a little bit and you can find one crawling on the floor or smoothly gliding in one direction. I’m not sure if it’s because of the quantity of sea turtles in the area or the fact that there were only a number of tourist boats there. There are regular sea turtles but every now and then we’d see a large one, which I’m guessing would be very, very old. Sea turtle in Pandan Island. 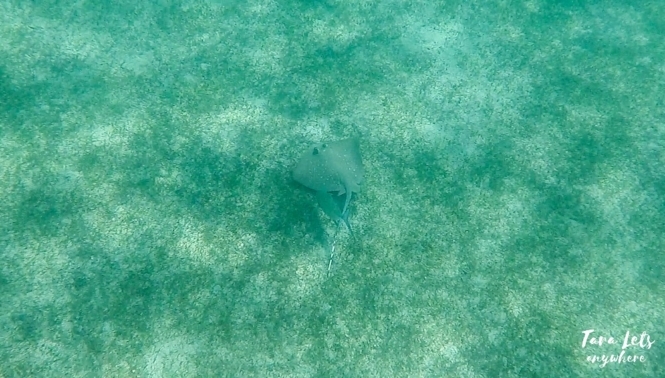 Aside from sea turtles, there are also stingrays and various fishes here in Pandan Island. 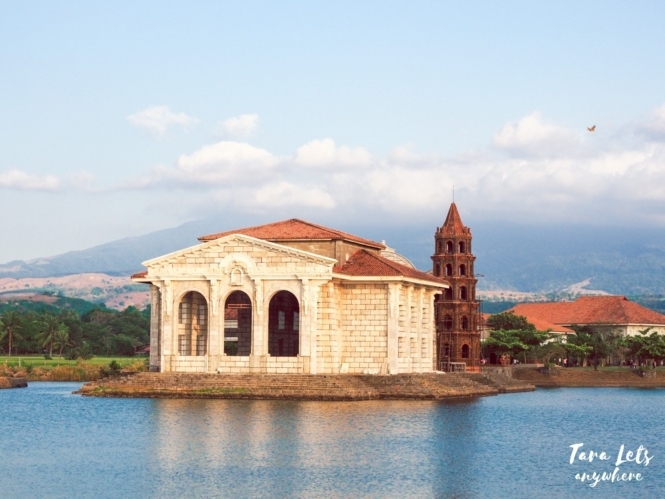 Take a local flight to San Jose, Occidental Mindoro. From there, ride a tricycle to the bus terminal and board a bus en route to Sablayan (2.5-3 hours). Option 1: Take a bus to Batangas Port. Hop on a ferry to Abra de Ilog (P260 ferry ticket + P30 terminal fee, 3-4 hours). From there, you can take either a bus (P220, 2-3 hours) or van (P250) to Sablayan. Option 2: Take a roro bus going to San Jose in Occidental Mindoro and get off at Sablayan. If you’re a budget traveler, option 1 is the cheapest option. Once in Sablayan, you need to register at the Sablayan Tourism Office and then take a boat to Apo Island (biggest island in Apo Reef Natural Park; 3 hours). 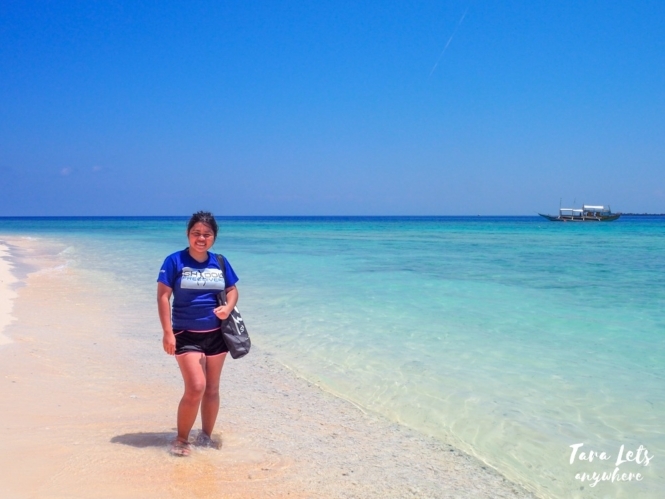 Here’s our 3 days itinerary to Apo Reef and Pandan Island. Full credits to my friend Peng for planning this trip. 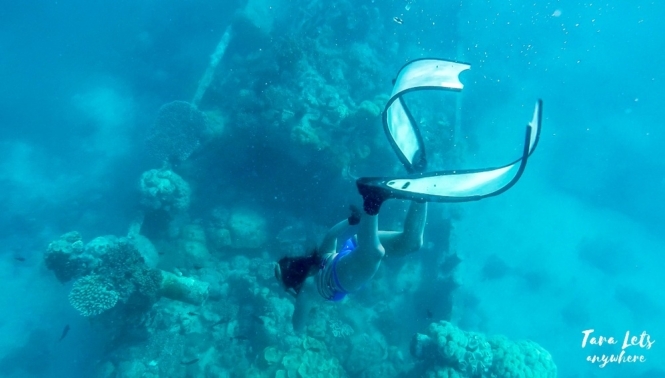 Apo Reef is an amazing island to explore especially if you’re the adventurous type and you snorkel & freedive. If you just want to swim on the beach and explore the attractions in the island (i.e., lighthouse and lagoon) a 2-day trip may be enough for you although the commute will be tiring. You can bring your own tent or rent one from the Sablayan Tourism Office during registration. Bring flashlight (for use at night) and insect repellent (in case there are niknik or sand flies). There are restrooms in Apo Reef but don’t expect something grand. Water is abundant but it’s also sea water. There is no signal in the island and no electricity. Make sure to bring a powerbank. Basically it’s similar to rough backpacking since you need to bring every essential items. Alternately, you can also stay in Pandan Island where you can find Pandan Island Resort (2 hours away from Apo Island). If you plan to stay in the mainland, you can book here for discounted rates of hotels in Sablayan. If you’re staying in Apo Reef, you need to bring and cook your own food. You can also coordinate with the tourism office to hire a cook(s), depending on how many you are in a group. You can buy the ingredients in the market yourself or just ask the cook to do it for you. Since we’re a group of 33 people, we hired 1 cook and 1 assistant. Our organizer Peng planned the menu with them and asked them to buy the ingredients. Overall, we were happy with the meals prepared by our cook Ate Perla. 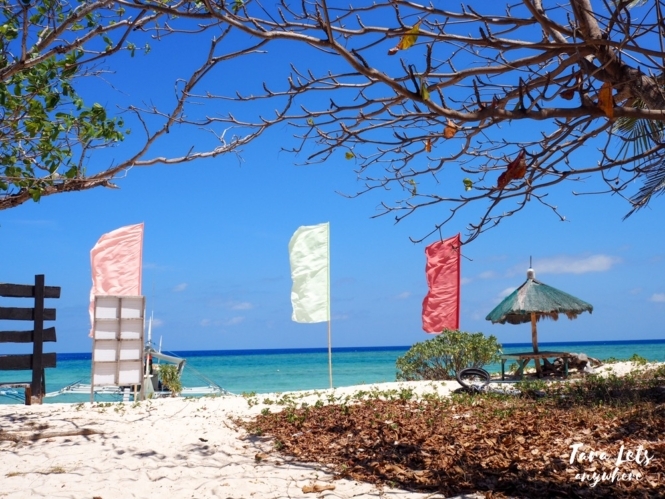 Snorkels, fins and tents can be rented in the Sablayan Tourism Office. Be respectful of the locals and the environment. Don’t bring home anything you’re not supposed to take, don’t step on the corals and stay a good distance away from sea creatures. Read this post on eco-friendly travel for more tips. Entrance fee to Pandan Island is not required if you’re not going to set foot on the island (i.e., ask your boatmen to wait several meters from the shore so you can snorkel around the island), but you still have to pay the environmental fee. As for the boat rates, price varies depending on size & capacity. You need to contact the Sablayan Tourism Office for inquiries and booking. We came in a group and our budget is about P4000 per person (excluding our individual commute going to Batangas Port). 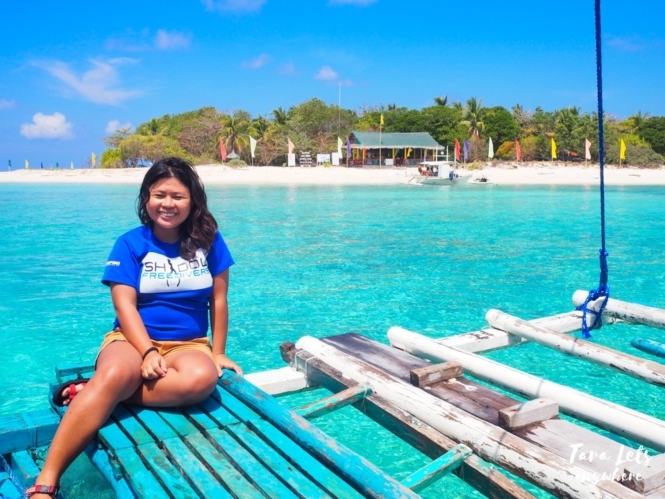 The tourism office assigns the boat & tour guide(s) that will accompany you in Sablayan. However, you can still request for specific people if you like, as long as they are available on the dates of your visit. We recommend getting Kuya James and Kuya Ambo as your tour guides as we were very happy with their assistance during our trip. Thank you Peng and Coach Rogelio for organizing this trip! If you want to learn to swim and freedive, please read our post on freediving lesson here and/or contact Coach Rogelio at Shadow Freedivers. May i ask if there are jellyfish in the snorkeling areas?